Much has been written about the entity now know as PVT (& formally Pivot) since their inception over a decade ago. They have been at the forefront of experimental sounds – creating a musical soundscape which has been critically lauded across all corners of the globe. Last we heard of Australian three-piece PVT, they were exploring the outer reaches of electronic rock with their 2010 album, “Church With No Magic”. The Australian trio have made a distinguished career out of making genre-bending guitar music, carving themselves a reputation as sonic innovators, and in 2008 becoming the first band from their homeland to sign to iconic UK label Warp. All of which makes their new album “Homosapien” — their fourth studio album and Create/Control debut — a startling listening. The difference is apparent from the instant you hit play on “Homosapien”: Richard Pike is singing. PVT’s records have featured vocals in the past of course, but this is the first release that’s placed Pike front and centre as a bona fide frontman. The change provides his band’s sound with a focal point that allows “Homosapien” to b more open, more intimate and yet also more direct than its predecessors. This is the document of a band as close as ever to defining ‘their sound’: a seamless collage of instruments, electronics, old keyboards and machines, and Pike’s voice. 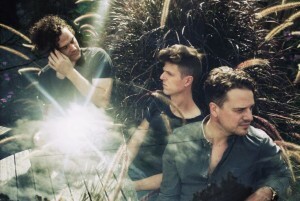 To create the sounds that became “Homosapien”, the three members of PVT spent a month in complete isolation in a quiet, remote, rural corner of Australia. They set themselves up inside a cavernous, 120-year-old mansion, well beyond the reach of modernity, and set to work With the band producing once again, the recording of “Homosapien” was overseen at that remote location by young engineer Ivan Vizintinand then mixed in London by Ben Hillier (Depeche Mode, Blur). PVT’s sound has already been described as a “futuristic INXS”, a sonic collision of machine and man, and indeed, “Homosapien” does sound like pop music from some distant future where song craft is as important as glitz and glamour. That’s not to say that PVT have abandoned the spirit of sonic adventure that’s characterized their back catalogue — “Homosapien” is as full of nuance and texture as anything the band have ever recorded, from floating opener ‘Shiver’, to the gothic, cathedral-like jigsaw of ‘Electric’, 3D love song ‘Vertigo’, or the throbbing vintage drum machines and found-sound samples of ‘Evolution’ and ‘Nightfall’. But their sound is more focused than ever, making this the most song-driven and spacious record they’ve made to date. Along with space and a renewed sense of identity, it would appear that in “Homosapien” PVT have also found their humanity.